There's certainly a never dull week in British politics. 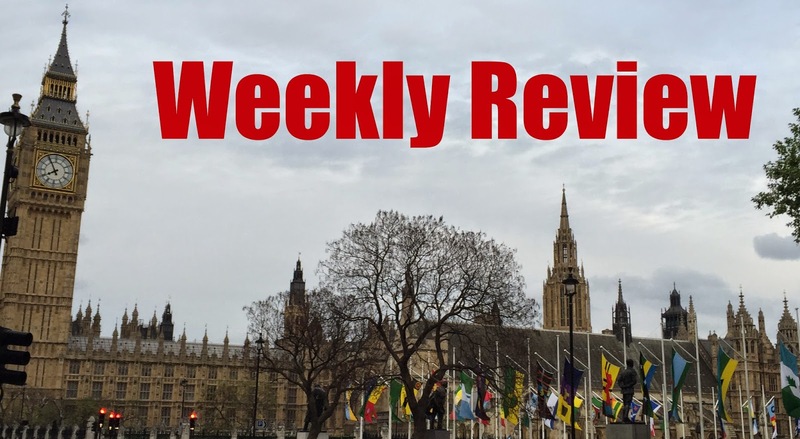 In this edition – The UKIP Civil War is over before it really began, there's trouble in the Commons over seats, the fight against the EU begins and even more trouble for the Lib Dems. The UKIP civil war finished as quickly as it started. Last week you'd be forgiven for thinking that Nigel Farage would be forced to stand down, however, this week it's fizzled out. The main culprit, Patrick O'Flynn, apologised for calling Farage "snarling, thin-skinned and aggressive" and resigned as the party's economic spokesman – a humiliating climb down for the MEP. Another casualty was Suzanne Evans (the author of the party's manifesto), her contract as UKIP's policy chief has not been renewed. Not even writing the party's very sensible set of election pledges – no promises to make the Circle Line a circle again this time! The loss of Evans is a massive surprise – remember she was nominated by Farage to be acting leader – but it does mean that despite her backing for Farage in public, things were not quite what they seemed behind closed doors. The likelihood is that Evans had leadership ambitious for herself and was more than a little peeved by Farage's unresignation without even facing a leadership election. Douglas Carswell has also clarified his comments about Nigel needing a break. He said that he meant that Farage should take a two week break "as leader" of UKIP, but not a break from being leader – Yeah...I'm sure that's exactly what you meant Douglas. Oh and Farage has now taken that break! This week has also seen Parliament back in session, but it's not being without controversy thanks to one thing...the Scottish Nationalist Party. The SNP promised to have an impact on Westminster, and they certainly have. Their MPs have been breaking all kinds of parliamentary protocols and traditions – from taking selfies at the despatch box to applauding in a chamber (a big no no, you should shout "here here" instead). But the thing that really riled everyone was seating arrangements – first the SNP tried to turf Dennis Skinner (veteran MP for Bolsover) out of his traditional seat and then they tried to sit on the traditional opposition benches – how dare they?! However, these actions are likely just the party trying to assert themselves in Westminster, and we can expect things to calm down once parliament gets properly underway. The SNP want to make sure people realise that things have changed and that they're here to stay… well for at least the next five years. In other less controversial news, the Speaker, John Bercow, was re-elected unopposed – a surprise after the attempts to depose him before parliament was dissolved. Bercow has been a controversial figure, often seen as biased against the Conservatives, but he is popular with backbenchers and modernisers – hopefully he will continue to have a positive impact on the house over the next five years. David Cameron has set out his stall on EU reform – with the upcoming referendum possibly happening as soon as next year. While he has admitted "it won't be easy" the Prime Minister says he feels confident in getting what he wants. On Friday, the Prime Minister met Jean Claude-Junker (President of the European Commission) and the guy who's appointment Cameron protested against last year – awkward! Several EU leaders have backed the PM's position, saying that cutting red tape can only be a good thing, although it seems unlikely that there would be any change to the free movement of peoples – oh dear! Although EU reform is definitely necessary, particularly due to its lack of democratic accountability, a "Brexit" is a worrying thought. All our major business is done with the European Union and if we leave that will not change – if the UK exits we will be in Norway's position, obeying the vast majority of EU regulation without any say in writing it. The worst of both worlds! Interestingly, the Labour party have now changed their opinion about the upcoming referendum – saying they will not oppose the bill as they have “reflected on the conversations on the doorstep.” Ed Miliband consistently refused to support a referendum, something that may not have helped Labour in its fights against UKIP. The only Scottish Lib Dem MP and former Scotland Secretary Alistair Carmichael has admitted he was behind the leaked memo in April. Don't remember?! Before the election, a memo emerged of a meeting between Nicola Sturgeon and the French Ambassador – in which the Scottish First Minister apparently said she would prefer David Cameron to remain Prime Minister. Of course, Sturgeon denied the account and Carmichael said that these sort of leaks happen in government. The Orkney and Shetland MP has now admitted that he approved the leak (what a surprise! ), that the contents were not correct and that he should have resigned from the cabinet. Sturgeon has received a letter of apology from Carmichael, but has called for his resignation as an MP – a by-election the SNP would most likely win. The reason Carmichael has spoken up now is an inquiry into the leak has also reported. It concluded that he "could and should" have stopped the leaked, but also that the record was an "accurate" account – meaning that Sturgeon actual did want Cameron to be PM. Confused?! You're not the only one. Although, it is certainly true that the SNP had the most to gain from a Conservative government being returned to Downing Street. All I can say to finish off the week is, please don't resign Alistair, I don't want to eat my hat!